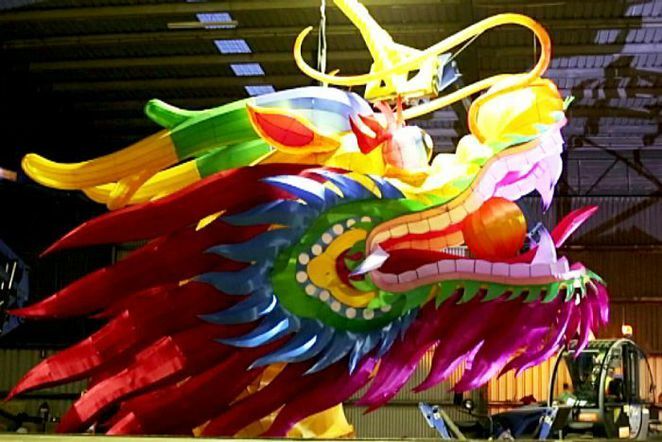 People who have never ventured out into the midst of a noisy, colourful Chinese New Year festival are missing out on a wonderfully vibrant cultural experience. These days it is very much part of the not-to-be-missed charter of Melbourne cultural experiences. There is plenty to see, hear, taste and enjoy. 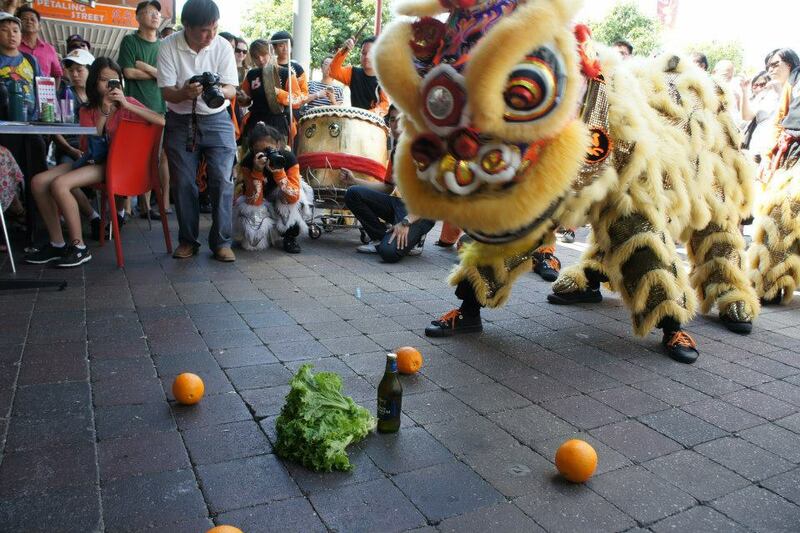 In the famous lion dances, lion dance troupes visit the shops of the Chinese community to perform the traditional custom of "cai qing" (採青), which means "plucking the greens." But unbeknownst to onlookers is that hidden in that pile of green leaves is a red envelope containing money. 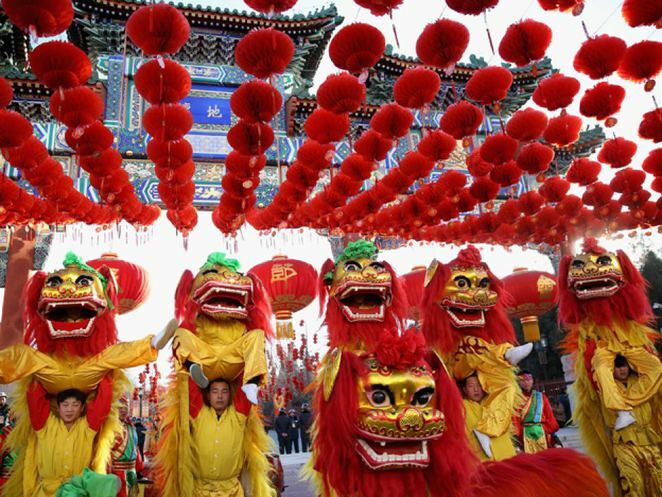 The "lion" will dance in backing off occasionally like a curious cat, to "eat the green" and "spit" it out but keep the red envelope which is the reward for the lion troupe. 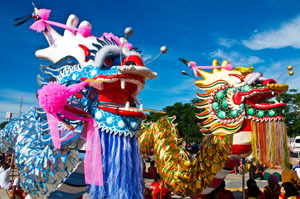 The lion dance is believed to bring good luck and fortune to the business for the year ahead. It is dramatic to watch because most of the basic lion dance movements are to be found in Chinese martial arts and this guys are fit as. You will often see the lion with the 'Laughing Buddha' who is dressed in a mask and monk's robes. He teases the lion with a fan made of banana-leaves which makes the lion jump around. The dance is accompanied by the music of beating drums, cymbals, and gongs, that are synchronised to the lion's movements. It is noisy and chaotic but totally absorbing to watch. To see some of the noise, bedlam and excitement watch the video below of the seeing-in of the New Year in Box Hill last year. Parents also give their children red envelopes with good wishes for their kids growing and staying healthy in the coming year. Again the red envelopes have money in them. Money put in red envelopes is believed to bring good luck, as in Chinese culture red is a lucky colour, so it therefore becomes lucky money.These envelopes also have gold characters on them with wishes for good fortune, health, wisdom, or prosperity. This comes from a legend which tells of Buddha, the Emperor of the Heavens, inviting all animals to share in the New Year's celebrations but only twelve animals turned up. To reward their loyalty, Buddha named a year after each one in the order they came: Rat, Ox, Tiger, Rabbit, Dragon, Snake, Horse, Ram/Sheep, Monkey, Rooster, Dog, and Boar/Pig. This year's 2015 Chinese New Year celebrates the Year of the Sheep, the eighth animal honoured by Buddha. Those born under this sign are thought to be considerate, sensitive and highly creative. 'Sheep' have been born in the following years: 1919, 1931, 1943, 1955, 1967, 1979, 1991, 2003. Famous "sheep people" born in the appropriate years include : Michelangelo, Rudolph Valentino, Mark Twain, and Orville Wright. You will see vivid bright red decorations everywhere. This is to keep away Nian and other such beasts of prey because legend has it that such beasts find the colour red frightening. 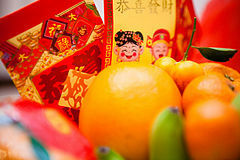 Rounds of firecrackers are let off to keep the beasts at bay and to frighten away ghosts so the New Year can start free of them. So add it all up and you have a whole lot of excitement, colour and noise that is not to be missed. Glen Waverley- most Chinese New Year events also have fun fairs. I have only been to a couple of the celebrations over the years most notably the Box Hill one. 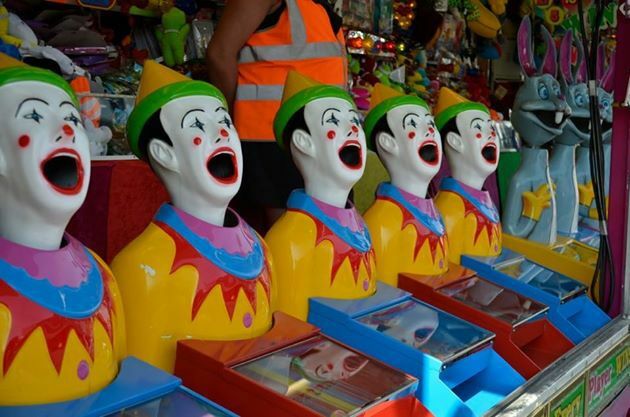 But increasingly as the attendance grows each year these celebrations have become huge and engaging events with free cultural entertainment, fun fairs that include children's rides and enormous numbers of food vendors selling dumplings and special festive dishes. Source Box Hill Think Outside the Box - Box Hill is a renowned for its annual celebration of the Moon Festival and extremely popular Chinese New Year Festival, which attracts around 70,000 people to the centre of Box Hill. 8.Federation Square	Melbourne	26 February to the 1st of March 2015	Click here for the program. 9. 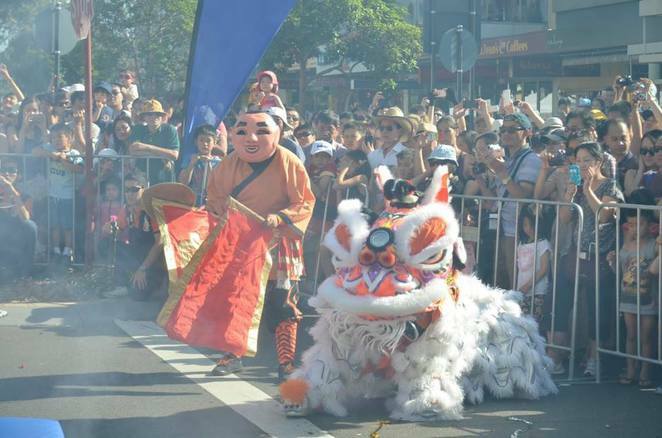 Glen Waverley	King's Way	1 March 2015	11am – 8pm (The Lantern Festival in Glen Waverley celebrates the 15th day of Chinese New Year and it is the last CNY Festival held in Melbourne every year.